Tom began working as a salesman for Tyree Ag in April 2011. Originally from Goodland, KS, Tom studied at Cloud County Community College. He then married his wife, Sherri in 1984 and they have one daughter, Alicia, and three grandchildren. Previously, Tom has managed Derks Farms and Morning Star Farms. 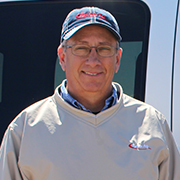 Tom values the customer relationships he forms as a Tyree Ag employee and enjoys learning the different production practices farmers use.